Students work on their rock creations with Emma Grape, Cardinal Kids Club site director. Front, l.-r., Eli Porter and Emma Grape. Back, l.-r., Dalton Rolf and Lincoln Rolf. 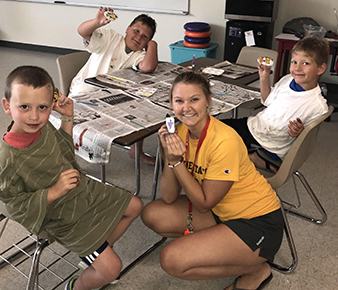 A new craze has hit Albion just in time for summer and it’s brought the entire community together for one common goal—painting rocks for others to find. The Albion Rocks project was initiated by Albion native, Emma Grape, who said the main idea is to encourage the entire area to get involved in this fun activity. Grape, who studies at Wayne State College, said she was first introduced to the idea in Wayne’s community. “I saw so many people having fun with it and I decided that it would be a really awesome thing to start in Albion,” Grape said. Everyone is welcome to participate, according to Grape. Grape has created a Facebook page dedicated to Albion Rocks. She said this provides the opportunity for people to share photos of rocks they are painting, hiding and finding. The success of the project is greater than Grape could have imagined. Read the complete story in the June 27 Albion News & Petersburg Press, Print and E-Editions.